Be sure to serve this mild spicy and refreshing pasta dish with the freshest seafood like large prawns, mussels or squids, and you will be impressed by this non soup version tom yum savory. I used yogurt as the cream in this recipe, to create healthier and lower fat dish. Otherwise, feel free to use full cream, for more creamy texture. 1) Rinse and trim prawns. Cut a slit on the back of each prawn to devein, but shells should remain intact. Season prawns with the listed seasoning. 2) Sprinkle salt, sugar, black pepper and chicken granule on the sliced/ flat side of brinjals. Heat sauce pan with 2 teaspoons of olive oil and sauté brinjals till both sides are browned and softened, for about 12 – 15 minutes. Remove from pan and set aside. 3) With the same pan, heat and coat with 1 teaspoon of olive oil over medium fire. Melt butter. Place in prawns, but do not crowd the pan. 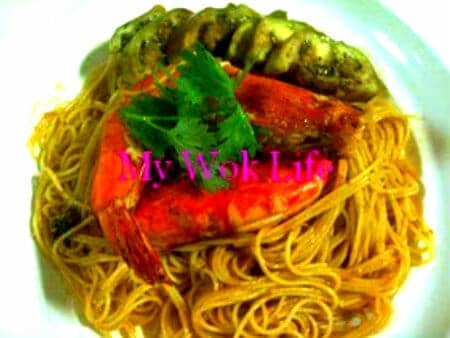 Sauté prawns on both sides till prawns are pinked and its shells are lightly crisped. Remove from pan and set aside. Repeat step till all remaining prawns are done. 4) Bring a large pot of water to a boil over high fire. Add in pinch of salt and few drops of olive oil. Place angel hair noodles in it and boil for 1 minute, or until half cooked (*If using spaghetti, boil it for 3 minutes). 5) While pasta cooks, quickly heat another sauce pan with 1 teaspoon of olive oil over medium fire. Sauté garlic and onion till fragrant. Add in tom yum pasta and stir fry for 2 – 3 seconds. Add in chicken stock, fish sauce and sugar. 6) When pasta noodles are half-cooked, drain and transfer pasta into the pan. Stir fry to combine well. Return sautéed brinjals into the pan. Cover pan with lid and reduce heat to low fire to simmer for 3 – 5 minutes, or till strands are soften and sauce thickened. Remove lid and add in yogurt and lime juice. Stir fry to combine well. 7) Return sautéed prawns into pan. Further stir fry for a minute before heat off. Dish up and divide pasta in each serving plate. 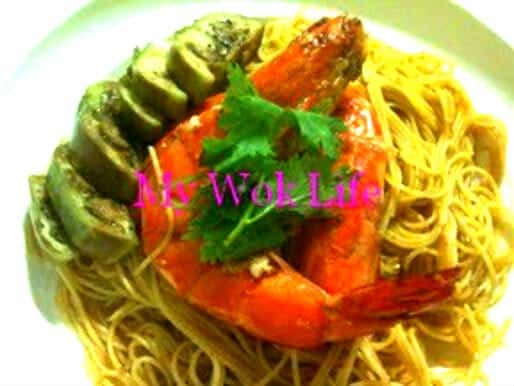 Arrange two prawns on top of the pasta and some sliced brinjals on the side, in each serving (*You may now tear the brinjals apart to divide them into the plates, if its skin is still remained intact). Garnish and serve hot. For more options: Use cream or coconut milk instead of yogurt, if you wish to create more aromatic dish than refreshing flavour. However, do consider the extra load of calories though. * Add also bird eye’s chili, for more spicy flavour. Simply sauté it together with garlic and onion in Step 5. A portion of my refreshing tom yum yogurt cream pasta counts about 400kcal. If use cream (low-fat or full cream) coconut milk, add extra 80 – 120kcal. Tips: Get tom yum pasta off the shelves. Add more paste, if prefer stronger flavour. * If you blanching dried pasta way before cooking into dish, toss it with some olive oil to prevent sticking if strands after leaving for a while. **If using fresh pasta, skip Step 5. Simply add into cooking accordingly. I love the idea. Yogurt as cream. Healthy and tasty living. Yum Yum! If you wont mind I’d love to guide Foodista readers to your post. Just add the foodista widget to the end of this post so it will appear in the Foodista pages and it’s all set, Thanks! Thanks, Steph.. Visit my site more! It must be omitted when I typed out the recipe.. Simply add in together when adding chicken stock and sugar.